Weekly Market Analysis: November 30th to Dec. 4th 2015 - Find the best Binary Options Brokers, Binary Options Bonuses, Binary Options Signals, Binary Options Software and everything Binary Options related on Binary Options Directory! Weekly Analysis: Last week’s price action was affected by Thanksgiving Holiday and price action was choppy, volatility was irregular but with a downwards bias. The main levels to watch this week are 1.0660 as resistance and the zone around 1.0500 as support. Price will most likely touch both of them as the week is full of major data releases but from a strictly technical point of view, we expect retracements to the upside. This is based on the fact that the Daily candles are showing long wicks (both upper and lower), which is a sign of indecision and the oscillators are long time oversold. The bearish momentum is starting to fade but keep in mind that we are still in a medium term downtrend. The week opens with Monday with the German Retail Sales, followed by the German Preliminary Consumer Price Index, both very important events for the single currency, mainly because the German economy plays a major role in the overall health of the Eurozone. Tuesday the United States will release Manufacturing data in the form of the Purchasing Managers’ Index and Wednesday we take an early look into U.S. employment with the release of the ADP Non-Farm Employment Change. Later the same day, Fed Chair Yellen will talk about the economic outlook at The Economic Club, in Washington. Thursday is the most important day of the week for the euro as the ECB announces the interest rate (not expected to change from the current 0.05%) and later ECB President Mario Draghi will deliver a speech at the usual Press Conference that accompanies the rate announcement. Journalists will ask questions and as always, this is a time when the euro can behave erratically so we recommend caution until the conference is over. Later in the day, Fed Chair Yellen will testify before the Joint Economic Committee, with the topic being monetary policy so we expect a day with strong movement. Probably the most important data of the week is released Friday in the form of the Non-Farm Payrolls which is considered the most important jobs related indicator for the United States. It shows how many new jobs were created in the previous month with higher numbers suggesting a thriving economy and contributing to a rate hike this year. The pound-dollar pair moved lower for almost the entire last week on the back of comments made by BOE Governor Mark Carney that rates will remain low in the near future. Talks about increased chances of a Fed rate hike also contributed to the fall. 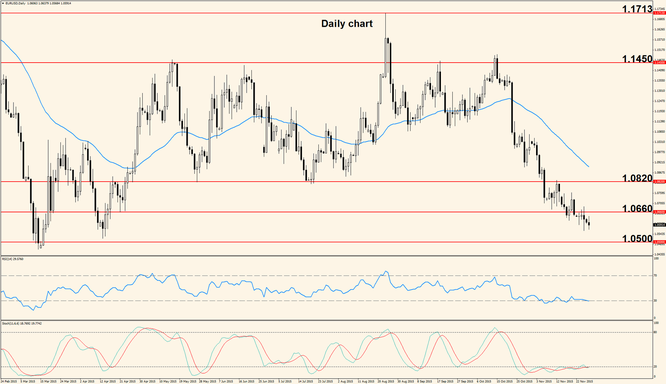 The pair moved below the key support zone between 1.5200 – 1.5170 and stopped right on the level at 1.5030. We expect the down move to make its way into the area around 1.4970 where it will probably pause or retrace higher. Movement throughout this week will be determined by the data released and the technical side will be secondary, with the main levels to watch being 1.5170 as resistance and 1.4970 as support. Tuesday Bank of England’s Governor Mark Carney will testify on the Inflation Report and on the Bank Stress Test results released earlier the same day; the impact on the Pound depends a lot on the results of the stress test and of course on the attitude of the Governor. The same day the Manufacturing PMI comes out, offering insights into the health of the British Manufacturing sector. 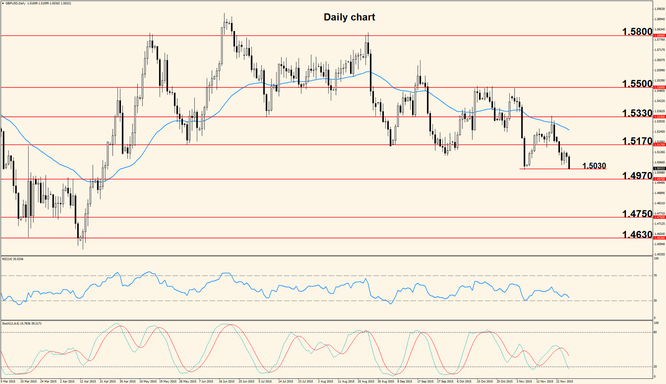 The rest of the week is rather slow for the Pound, with the only notable events being the release of the Construction PMI scheduled Wednesday and the Services PMI programmed for Thursday.